Again, it’s just something I made up, but it turned out wonderful...this time! Sweet fig mixed with the deep Port enhanced the succulent lavender pork. 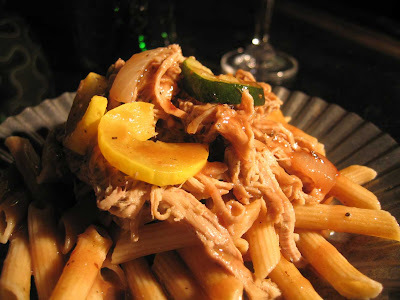 I chose a wheat penne pasta with a slight fear that it might be too heavy for this dish, but it complimented the pork, hearty zucchini and squash perfectly. I was contemplating couscous, but it would have been completely lost in this dish. Don't avoid a strange ingredient like lavender by staying late at work, embrace it with port and pork and remember it's all a matter of trial and error. Let this delightful flowery herb help you be fat and happy! 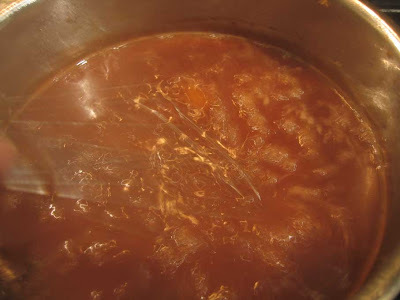 Tip and techniques: I started this process early in the morning with the use of a crock pot so plan ahead, but it is quite simple. 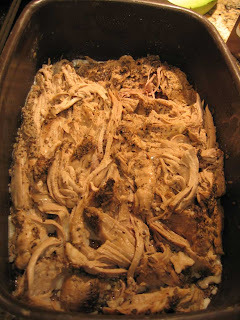 Let the pork sit in the crock pot all day while you’re at work and it will be perfectly moist when you return. Cooking the pasta in a chicken broth helps to flavor the pasta, plus some of the pasta water will be used in the pork. Place the pork in the crock pot with a little bit of water; fresh ground black pepper, salt and about 1 Tbls of dried lavender. Put the cover on, set to low and let it cook for 8-10 hours (you can also cook this in just 2 or 3 hours at a higher temperature if you need to). Continue to sautee just a few minutes keeping a little bit of crunch in the veggies. Use 2 forks to ‘shred’ the pork. 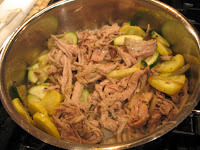 Combine the veggies with the pork in the crock pot to keep warm. Start the water to boil the pasta, follow package directions but use at least 1 can of chicken broth or add two chicken bouillon cubes into the water. Add the pasta when the water boils (start the sauce while the pasta is cooking), drain and save at least 1 cup of the water if you haven’t make the sauce yet. Toss the past with a little olive oil after straining to keep it from sticking together. Let the sauce boil until thick and reduced by half. Whisk in 1 Tbls of butter to the sauce, remove from heat. To plate: Place pasta in the middle of the plate, add the pork and veggies on top, now drizzle the port sauce over everything. The sauce on its own may seem lackluster, but once it hits the lavender pork - it’s fantastic. Enjoy immediately. Holy Crap! I guess we should send you a tupperware container with each secret ingredient so we're not left drooling while reading your blog! My first comments on the Blog! Yea, Thanks Aaron! Look for a lavendar drink coming this weekend, and a Pink Salt and Pepper Cookie too! This is delicious. Love the way my house smelled when i walked in the door. Thank you for sharing.